Like all the countries I visit, I am always left with good, bad, and sometimes puzzling memories of what I have witnessed and experienced. Morocco was no exception. I shall begin with all the things I love about this country, the first being their food. 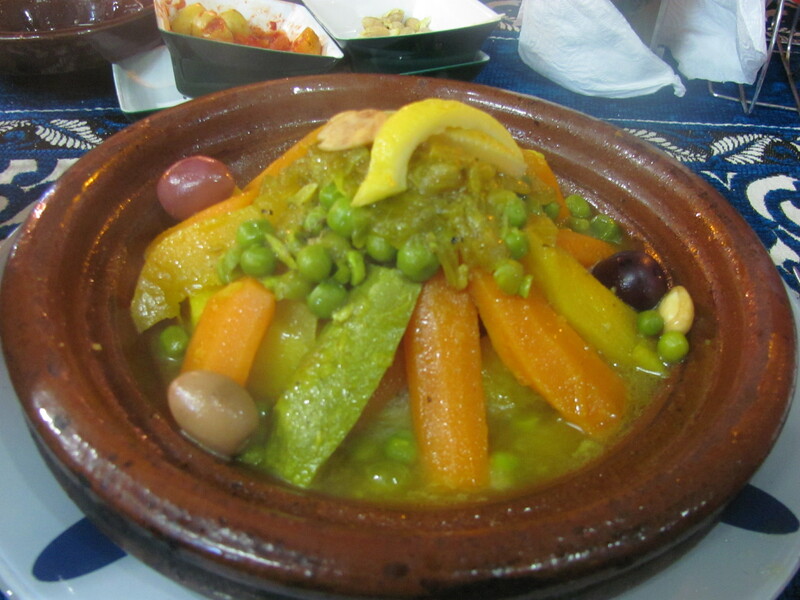 Who could forget their savory tagine dishes for which this country is so famous? Practically every day I would order a different one. Some were better than others but my favourite was the lamb. 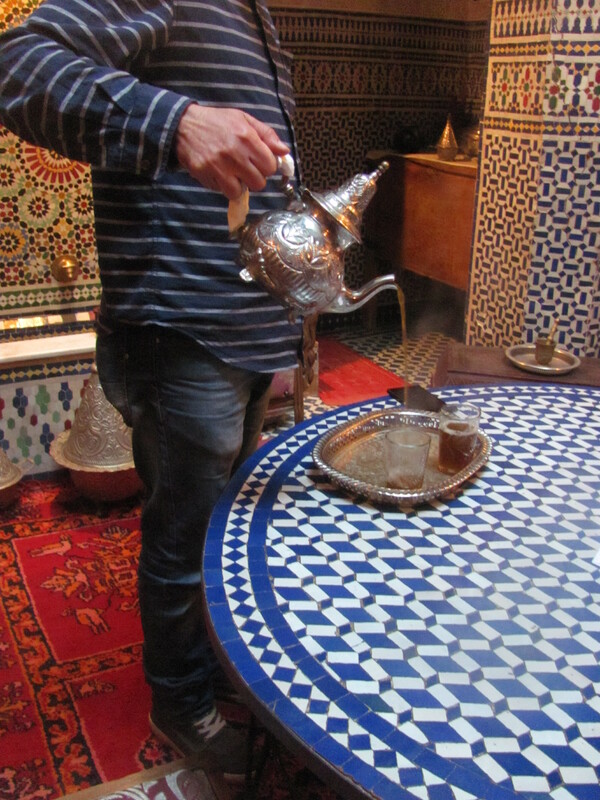 For me the tagines were the perfect comfort food providing all the nutrition I needed. Freshly squeezed orange juice was another must to start my day off right, followed by a latte or cappuccino. Orange trees grow everywhere in the northern part of Morocco making their juice available in all the restaurants and hotels. I must add that their croissants and pastries were pretty good as well. For those who like the cafe scene (as I do) which provides excellent coffee, sweets, and a relaxed atmosphere, Morocco does this admirably. They are everywhere it seems, in the cities and larger towns and are no longer just a haven for the men to gather, but are slowly seeing women as well. They are also the perfect hangout for tired tourists and ex-pats. The legacy of the French is definitely alive and well in the present day Moroccan cuisine and cafe scene. Second on my list of ‘most memorables’ would have to be the beautiful Moroccan architecture which has done so much to influence our Western architectural styles. The old part of any town or city (medina) is the best place to go and take it all in. Here you will find the narrow alleys and streets often dominated by the beautifully tiled minaret of a mosque which, of course, points in the direction of Mecca. 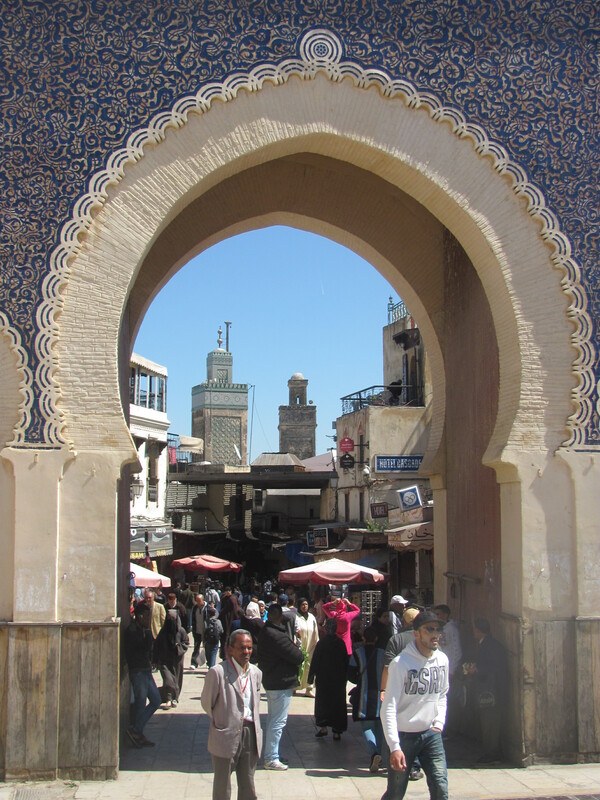 The elaborately tiled and horseshoe-shaped Bab Bou Jeloud gate leading to the medina in Fez. 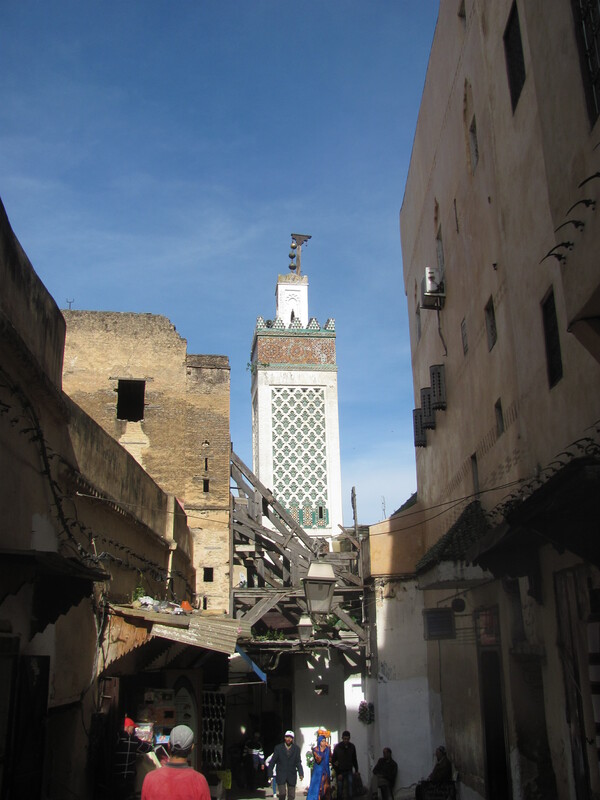 A minaret overlooking the medina in Fez. 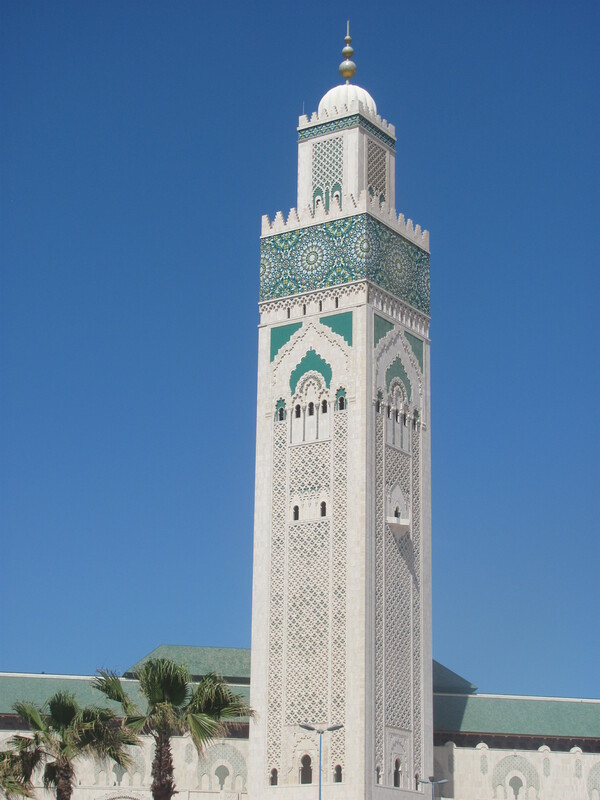 Unfortunately, most mosques are closed to non Muslims except for the Hassan II located in Casablanca. Erected in the early part of this century by the former King, it is now the third largest in the Islamic world. 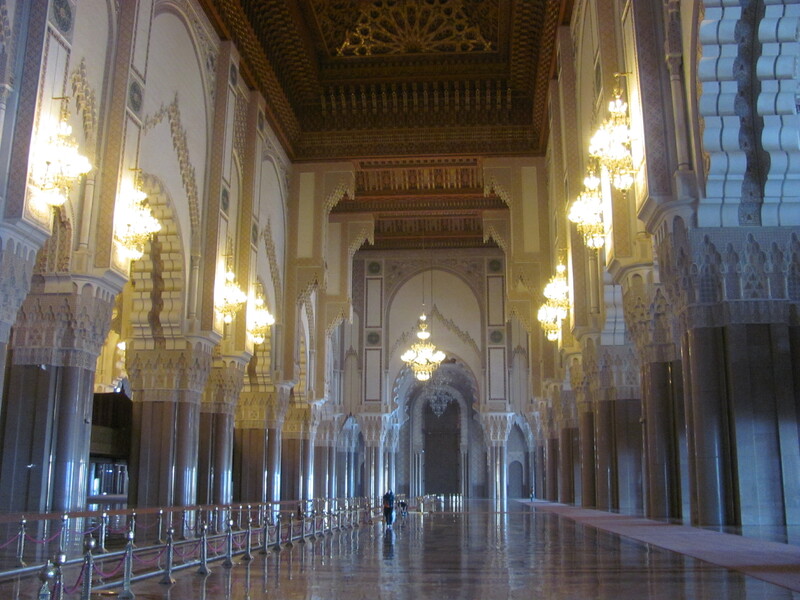 The beautiful Hassan II Mosque in Casablanca. The interior of the mosque. However, those mosques that traditionally serve as a university do allow visitors to explore the medersas, the rooms where the students live and study. 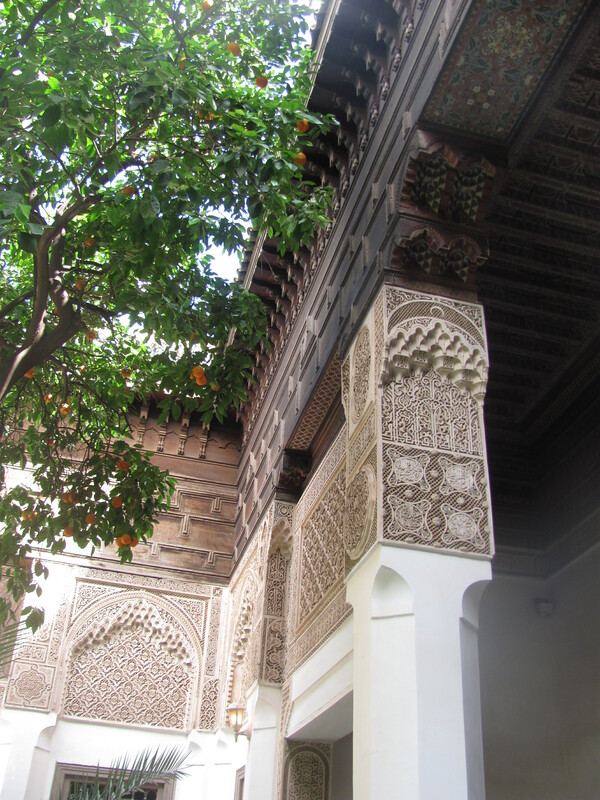 We observed first hand the horseshoe-shaped doorways, intricate wooden carvings, geometrically designed tile work, and calligraphy denoting quotations from the Koran at the famous medersa of Ali ben Youssef Mosque as well as the Bahia Palace in Marrakesh. Since representational art isn’t allowed by Islam as it speaks of idol worship, it’s not to be found in the mosques and public museums which explains the elaborately carved art pieces in tile and wood instead. 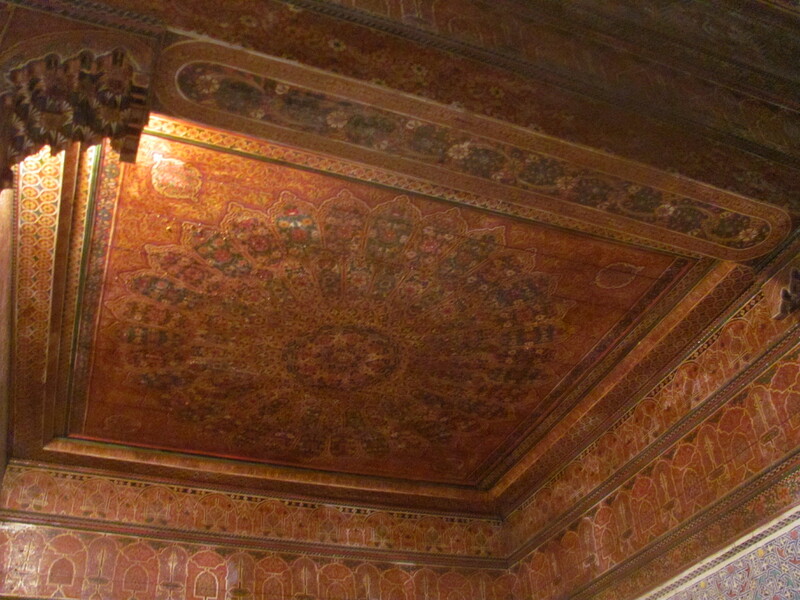 Wood-carved ceiling at Ali ben Youssef medersa dating back to 1565. 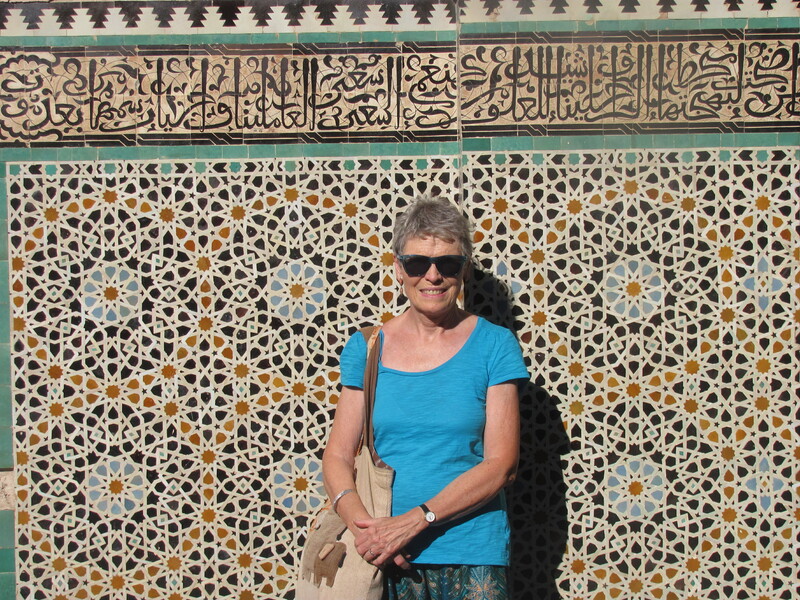 Couldn’t resist a photo with this intricate tiled backdrop. Marble carvings at the Palace in Marrakesh. Most traditional Moroccan homes are three-story affairs with a central courtyard that may or may not be open to the sky. The rooms look inward which means the rooms are dark save for the light coming through the windows facing the central court. The larger homes of the more wealthy will have a central garden with orange trees and fountains. Many of these homes have been made into swanky hotels or B&B’s and are called riads. 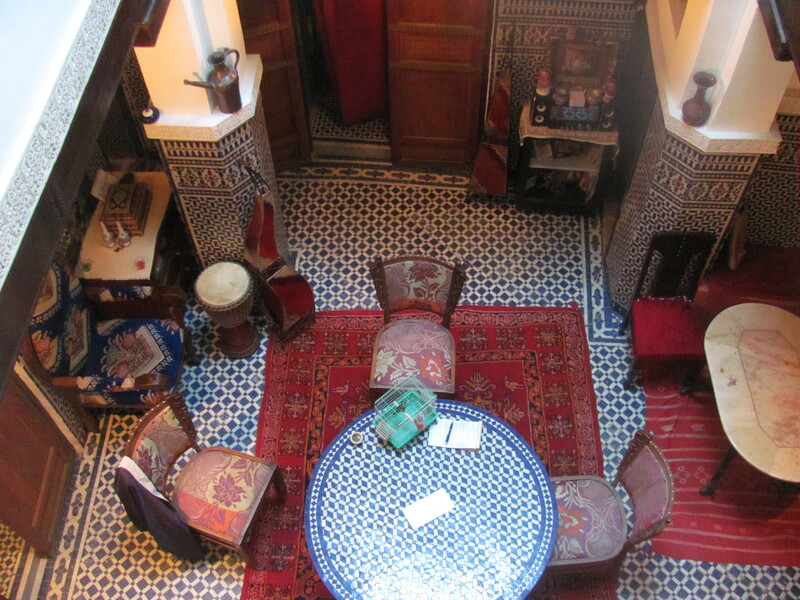 We stayed in a riad which we rented through AirBnB in both Fez and Marrakesh. Although happy with our modest lodgings, we did find they were rather chilly in April. Looking down from the 3rd level of our riad in Fez to the central area where we ate our breakfast and chatted with our host and other guests. Out host pouring us some mint tea. Not everyone would agree with me, but I must admit I liked waking up to the call of the muezzins every morning summoning the faithful to prayer. I realized this call to prayer explained why at one or four o’clock in the afternoon stores were often deserted, or why the merchant we had been talking to a few minutes before had suddenly disappeared. It wasn’t unusual to spot a man hauling out his prayer mat in a park, for instance, and kneeling down to say a quick prayer to Allah. The various modes of dress exhibited by both the men and women were not just a source of fascination for me but also one of puzzlement. Clothing is probably the most visible way of expressing the mix of the traditional with the modern for which Morocco is famous. Most men dress in the western style resorting to the traditional for certain occasions. In the medinas it is common to see them dressed in a jellaba, a wool or cotton garment with a hood, especially in the early mornings for warmth. Babouches or leather slippers with long pointed toes and an open backs are also popular. The fashion styles for women, however, are a very mixed bag. Except for Casablanca, a more modern city, most of them wear a scarf or head covering which can be black or any other colour or design. From the neck down it might be a long dress of any colour or jeans. Those dressed from head to toe in black were rare in the cities but more common in the rural areas. The kids, however, all wore western dress. Apparently the choice to wear traditional or modern dress comes later in life and is a personal decision. To quote one young woman with impeccable English, dressed in jeans and no scarf of any kind who told us when we asked her how she had made her decision, she replied: “It’s a choice I will make to wear a veil or scarf based on my relationship with my God.” She has not ruled out the possibility of adopting the scarf in the future. Does this suggest that as women mature they are likely to become more religious, or perhaps it’s simply a way for them to express their freedom in an area which they haven’t had much say in the past. Traditionally, the mosques have always been dominated by the men while the women kept their beliefs hidden and focussed on their families. 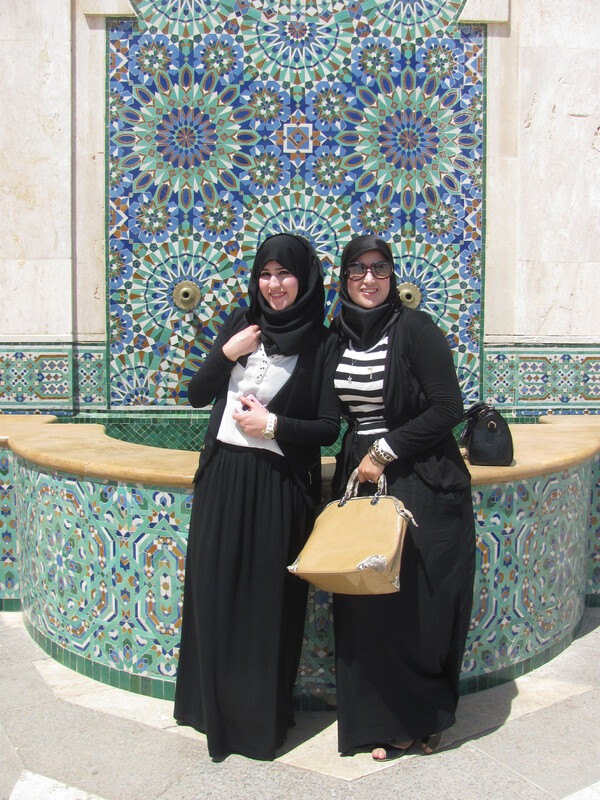 Young women at the Hassan II mosque, who asked me to take this photo, dressed in a fashionable but traditional style. Mixing the traditional with the more modern. The ultra traditional style in small desert village in the south. 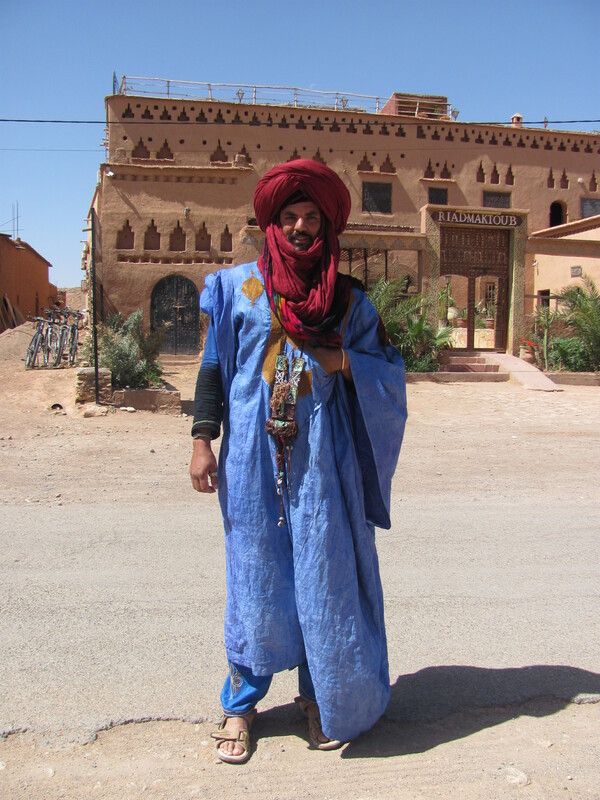 A man in the traditional dress of the Berber, the original natives of Morocco. Throughout our month of travel which took us from Casablanca in the north-western part of the country, to Fez and Marakesh in the interior, up through the Middle Atlas mountains to the desert in the south, and finally out to the Atlantic coast, I could not help but be awed by the beauty and diversity of which this country has been blessed. Snow-capped mountains, long sandy beaches, rolling sand dunes, and lush oases are a photographers delight. Add to this the rich Moroccan culture which easily reflects the old and the new and a traveller will be tempted to stay much longer than planned to see it all. I must mention that such diversity yields a mixture of climates which overall are not too extreme especially in April when we were there. The nights were cool in the north but the days were mostly sunny and warm – a comfortable Mediterranean climate. The desert was hotter but not unbearable at this time of the year. 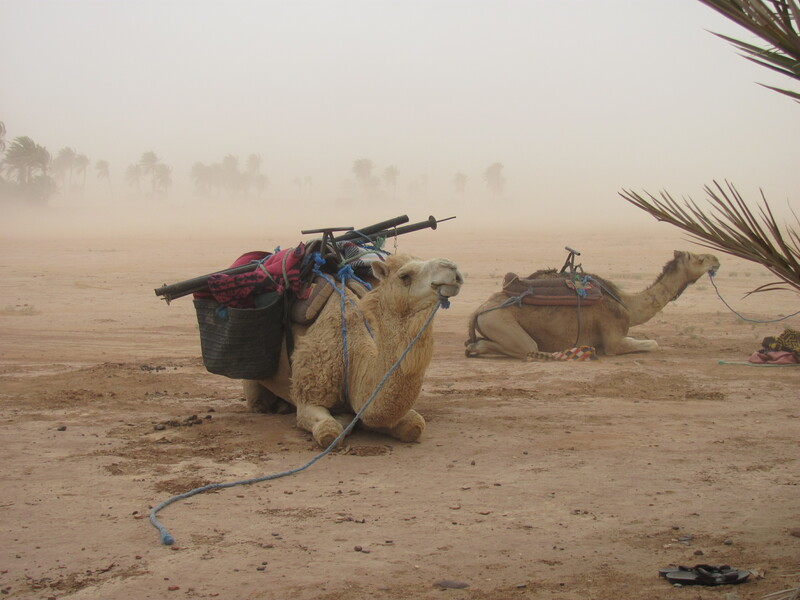 However, there is a risk of sand storms which we encountered while on our camel trek which you can read about in my last post – A Saharan Adventure. The winds also prevented us from spending much time on the beaches so we didn’t get that anticipated tan we hoped for. If you want to avoid the winds it’s best to go in the fall. 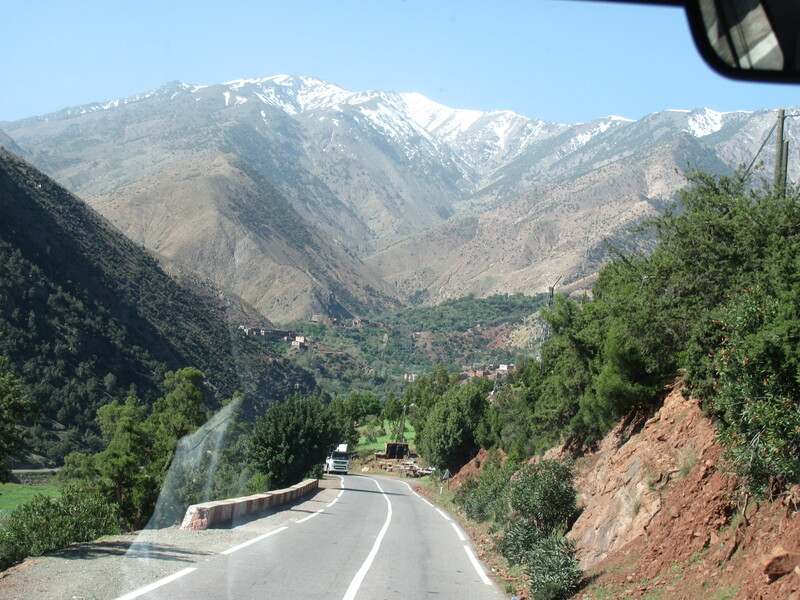 Our bus ride through the Middle Atlas Mountains. Sand storm coming up in the desert. There really was very little to not like about Morocco. We had some minor annoyances from some pushy taxi drivers, shopkeepers, and fake guides who just couldn’t take “no” for an answer. When people in a poor country like Morocco with a high illiteracy rate see hoards of tourists, they wrongly assume that all of us have tons of money to throw around. The best way to deal with this is to brush up on your reading before entering the country and be prepared for the hassle. Know the rate of currency, understand where the people are coming from, and be prepared to bargain for just about everything. Once you get to know how taxis operate and what you should be paying, it gives you a bit of leverage to bargain for a fair price. Hubby got to be quite an expert at handling the taxi drivers which pleased me to no end as I am sure being a woman on my own I would not have done so well. 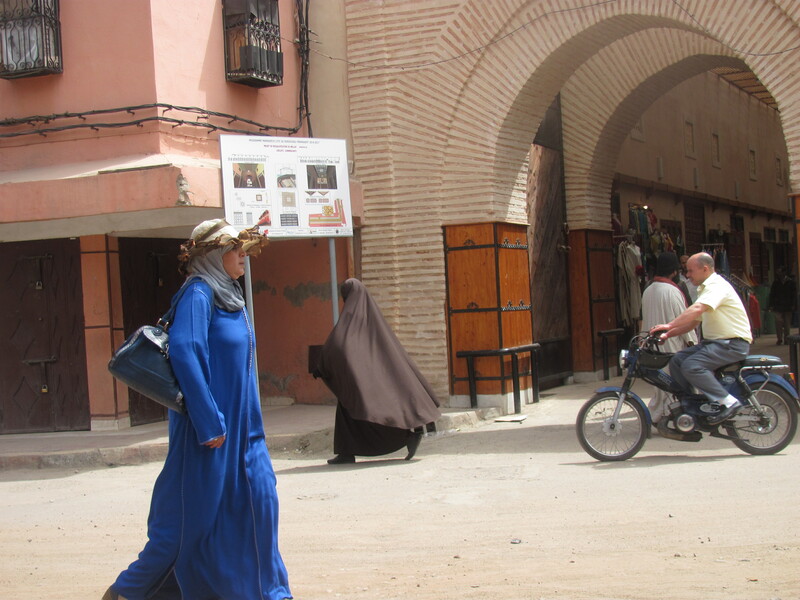 Unfortunately, even in Morocco female travellers travelling solo have to be ready for more hassle. 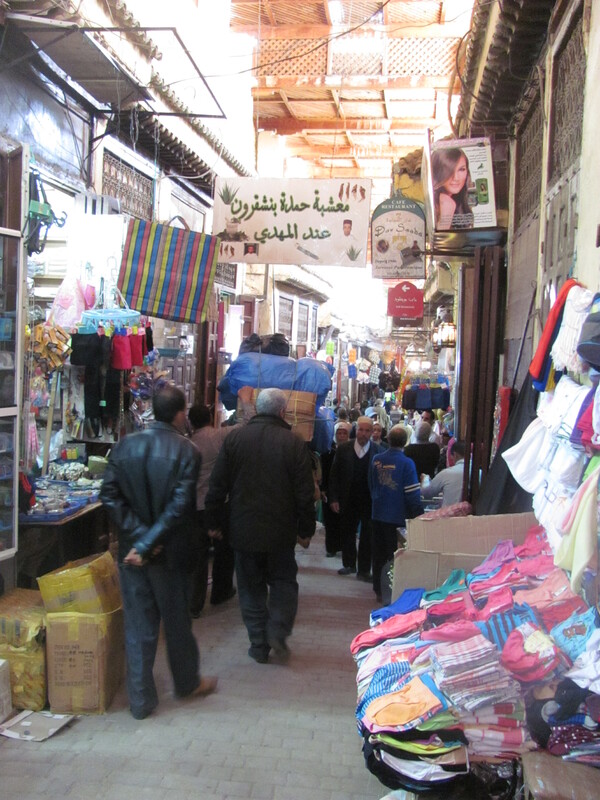 Not to be outdone by hubby, I have to admit I became an expert in handling the pesky shop keepers by forcing myself to walk right past them, giving little eye contact and just a simple la shoqran which is the Arabic for “no thank you”. If you smile and let them engage you in conversation, then you are in for trouble. 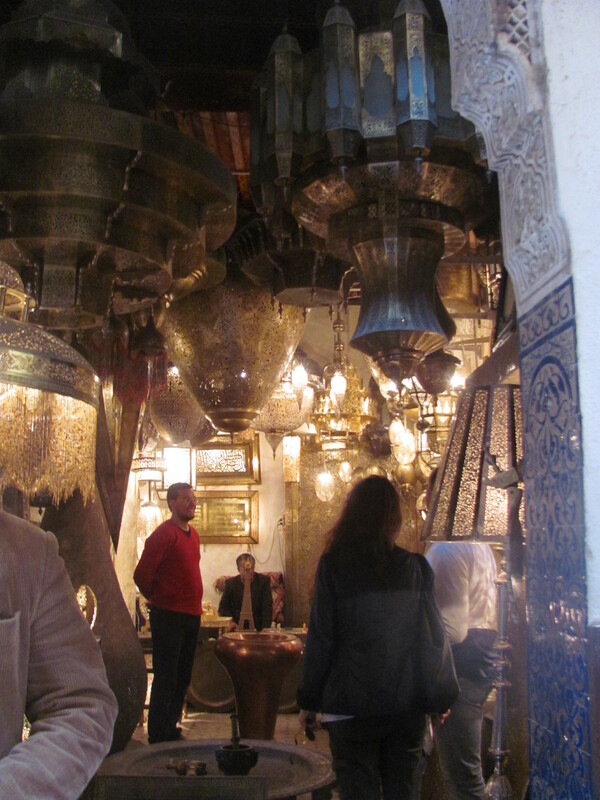 Shops in the crowded medina in Marrakesh. To the tourist, Morocco is seen as one of the more successful Arab countries where we can visit and still feel accepted and safe. As I wrote in my previous posts on Morocco, most people we met were friendly and very open to offering their own special brand of hospitality to us. Since its independence from France, Spain and Portugal, who all established their power over this country in the last few centuries, Morocco has been successfully governed by an absolute monarchy along with a moderate elected government which was founded in 1998. It has readily opened its doors to the Western World and has so far managed to escape the Arab Spring uprisings while its neighbours, Egypt and Libya are in turmoil. The present day King, the son of the infamous Hassan II, is more visionary than his autocratic father and is making such necessary reforms as building schools providing a free education to all children and successfully passing a law in 2004 which gave women the right to divorce. There are some social services, such as health care,but to just what extent, it was difficult to determine. A government official we spoke to was positive about their system, but a poor teacher of high school English was not so happy about it. The country is 99 per cent Muslim with no division between church and state. Civil law is provided by the sharia, the religious law as stated in the Koran. Most higher education is still being provided by universities which are controlled by the mosques. I do wonder how this can work in a world which is changing so quickly? In some ways, I can see it is working at present, but for how long? The people seem to be satisfied with the direction the government is taking based on information we gathered on our train and bus trips where we met some young, well-educated young people of both sexes. They accept with some resignation on how their government is keeping a close eye on any terrorist activity by having very visible army personnel guarding special buildings and tourist areas. 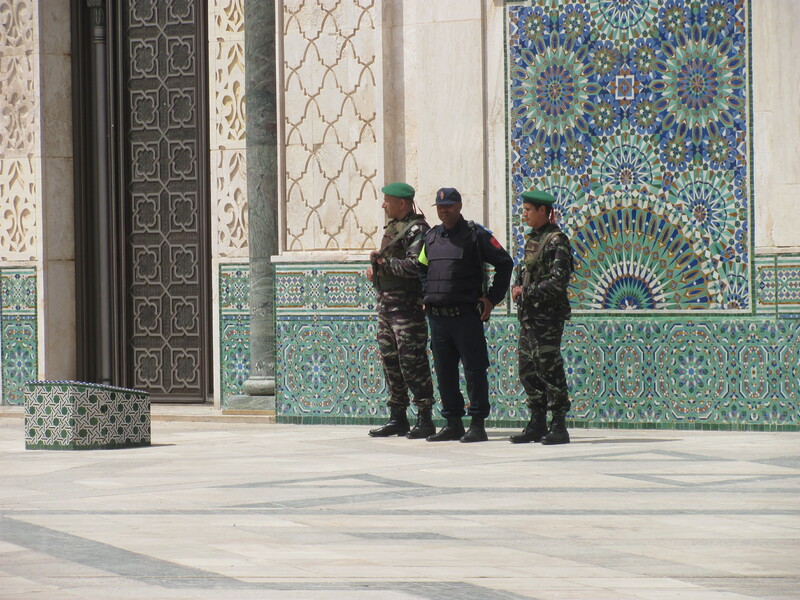 Standing guard at the Hassan II mosque. They vehemently denounce all terrorist activities in other Arab countries placing peace and sharing high on their list of priorities. One of the young tour guides on our camel trek told us about his efforts in working with a peace group in Senegal, a war-torn country to south of Morocco. 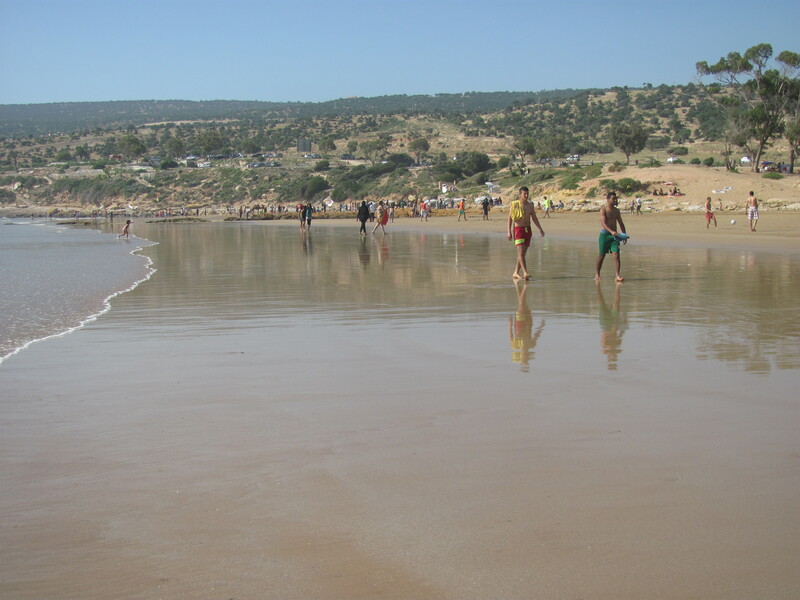 Some of my friends and acquaintances have asked me if I would return to Morocco again, and my answer is always “yes”. There is still much more I could see and do. It’s still a safe country with something to offer all types of travellers. With the help of friendly people who speak French and some English and an efficient transportation system, it is very easy to move around. Most important, it’s still affordable for all budgets. Let us hope that they can maintain peace in their country and remain a beacon for the rest of the Arab world. 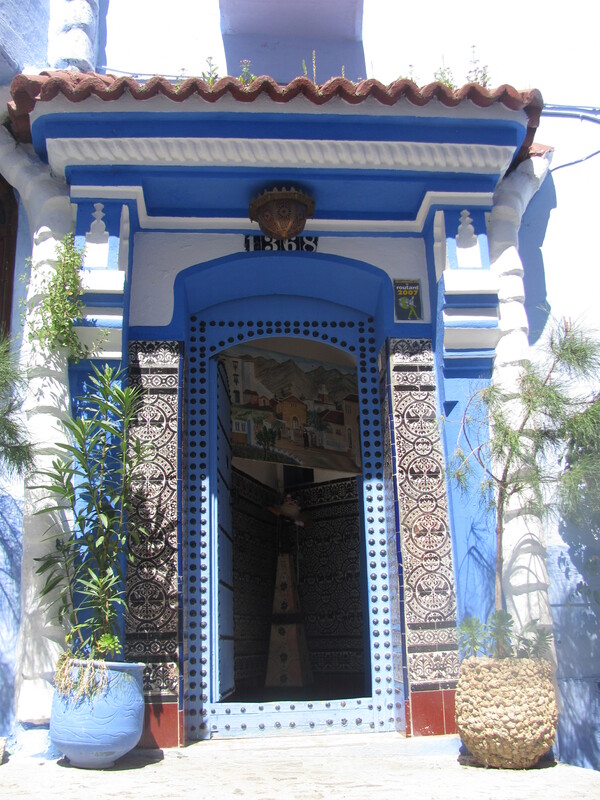 Doorway to a home in Chefchouan – the blue city in Northern Morocco.